Avengers writer and director Joss Whedon is known as one of the prolific television showrunners in history. His credits include Buffy the Vampire Slayer, Firefly, Dollhouse and many more. This semester, Jason E. Squire’s Art and Industry of the Theatrical Film (CTPR 386) class analyzed Whedon’s 2012 film The Avengers from Marvel Studios. 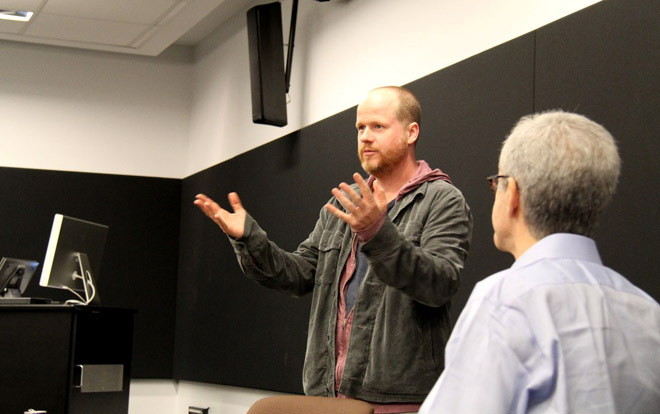 On November 20th, Whedon visited the class and told the students that he had to adjust his style to work in feature films. The Avengers tells the story of how Marvel Superheroes from various storylines come together as a group to do battle with the invading armies of the Chitauri. Whedon faced the unique challenge of having too many heroes to tell his story but felt that he had to have a good reason to get the characters together. Offered to students across all six SCA divisions, Squire’s class is a survey of the entire film industry using a single film as a case study. This semester, The Avengers was the case study, including class visits from Whedon, President of Marvel Studios Kevin Feige , Production Designer James Chinlund, ILM Visual Effects Supervisor Jeff White, VFX Producer Susan Pickett, Editor Jeffrey Ford, Executive Producers Jeremy Latcham and Louis D'Esposito (co-president, Marvel Studios) and President of Marvel Studios Kevin Feige. Previous guests of the course have included J. J. Abrams and his keys for Mission Impossible 3, Star Trek and Super 8, David Fincher and his keys for The Social Network andGirl With the Dragon Tattoo and Spike Jonze and his keys for Adaptation andWhere the Wild Things Are. To close, Whedon stated that he hoped The Avengers worked on several levels to be more than a superhero movie. He told the students that in genre pictures, most studios have a paradigm that needs to be avoided to produce a great film. 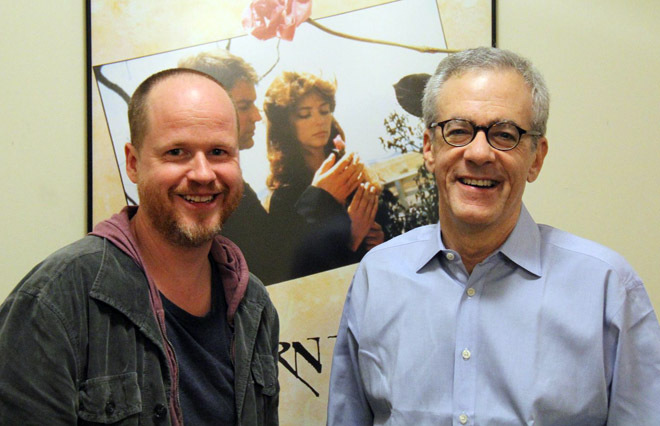 “I wanted to make a superhero movie that was satisfying on a higher level,” continued Whedon. “We went away from some things that I think most people wouldn’t have avoided. In any genre, there’s a formula. As studios figure it out, it gets boiled down and down until the life disappears. [The Studio Executives] know, ‘These are the beats that we hit’ and, at some point, they forget about the story. We made a point to step outside of the lines. One of the things that I love about working with [Marvel Studios President] Kevin [Feige] is that he said, ‘We have an entire reel of people talking and I’m OK with that.’ Not too many executives would do that. Whedon is currently writing the sequel to The Avengers.